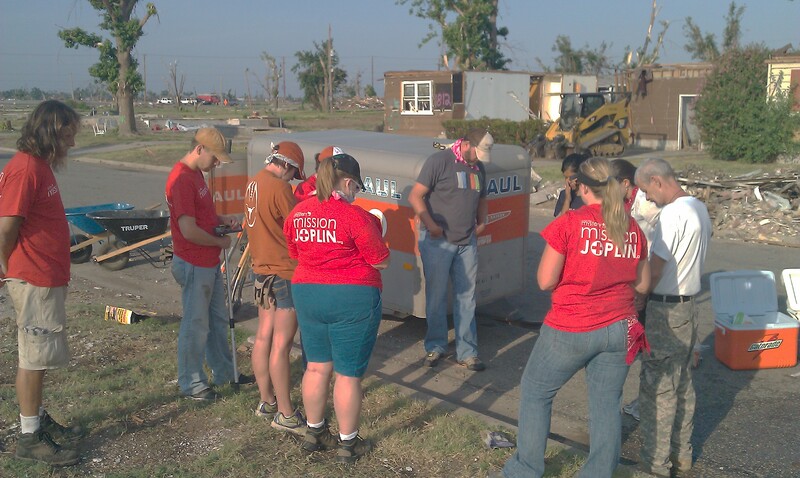 It’s Saturday morning, and we are about to begin our second and final day of work in Joplin. The roofing team has left at 6:00 am to beat the heat, and we leave about an hour later to finish debris removal. Everyone is noticeably tired from the 1st day’s work, but we are in good spirits. With coffee, and a cup of oatmeal down we head back to the debris removal site. It’s slightly cooler with a little bit of cloud cover, and a small breeze. I feel the need to begin with prayer so we make sure to do so before beginning work. Today we take on pile # 2, which appears to contain larger items than the first pile so we are hoping this will go faster. It does. We continue to sort through 2×4’s, drywall, roofing, and of course personal items. As we continue our work another church from St. Louis, Mo continues their work across the street. 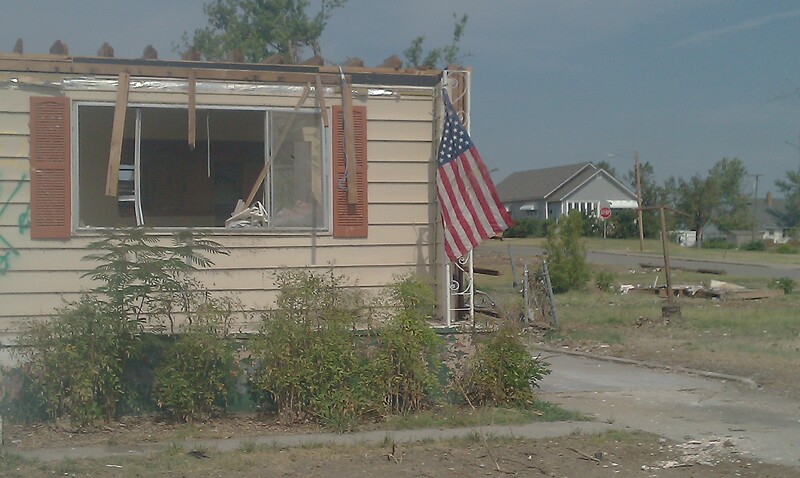 We learn they have been to Joplin prior for recovery efforts. Both groups have learned that not having heavy equipment make a huge difference. We are quickly coming to a finish on the debris removal. A welcome sign since even in the early morning, the heat is on. I see someone from the crew across the street hanging an American flag as they are wrapping up. It’s encouraging. Just then Rodney from Mystery Church comes riding up. As we all rest, he tells us about the day the tornado hit. 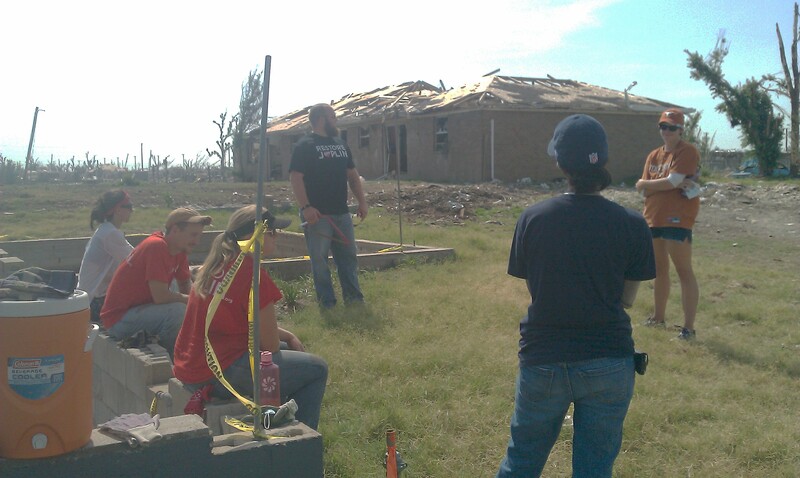 He was at the church with others doing a study at the time the tornado hit in the evening. It was not until it had passed that they new the extent of the storm. The was almost no warning, and within about 6 minutes the EF5 tornado devastates the south part of town. They begin to check homes and apartments for people, and the task is difficult. Streets are impassible, gas lines are on fire, power lines are down. Luckily, most of the people in the effected area make it alive. We seem glued to his words as he tells his story. It’s is a wrap at the site, and we make our way back to the original house we worked on. On the way Jacob, the pastor for Soma Church, talks about how natural disasters like tornadoes are a result of the curse on the earth at the Fall. I think about how its helpful to remember this when people question the goodness of God and natural disasters in our world. Jacob is a good pastor, and leader. He has taken good care of us on this trip, and it shows he has a heart for people. As with a good teacher, he goes to Scripture as the authority. It’s been good to meet him, and learn more about his ministry. 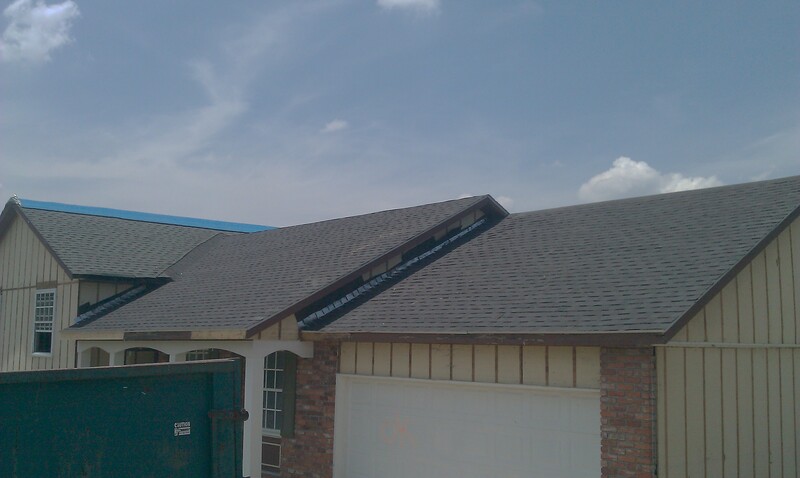 We arrive back at the house to see that Bernie & the roofing crew has made awesome progress on finishing the roof. We will have lunch and then help clean up the mess. As we sit and eat lunch we can’t help once again to notice the swimming pool in next door. We all joke about jumping in the cool water. We finish lunch, and then work on cleaning the place. Within a couple of hours the roof is finished, and the work at this project is done. Tired, and hot everyone is relieved, but I feel we have a sense of gratitude. We all worked very hard these past 2 days, and I know we made difference. We head back to the church in time shower at the Joplin Y before they close for the day. 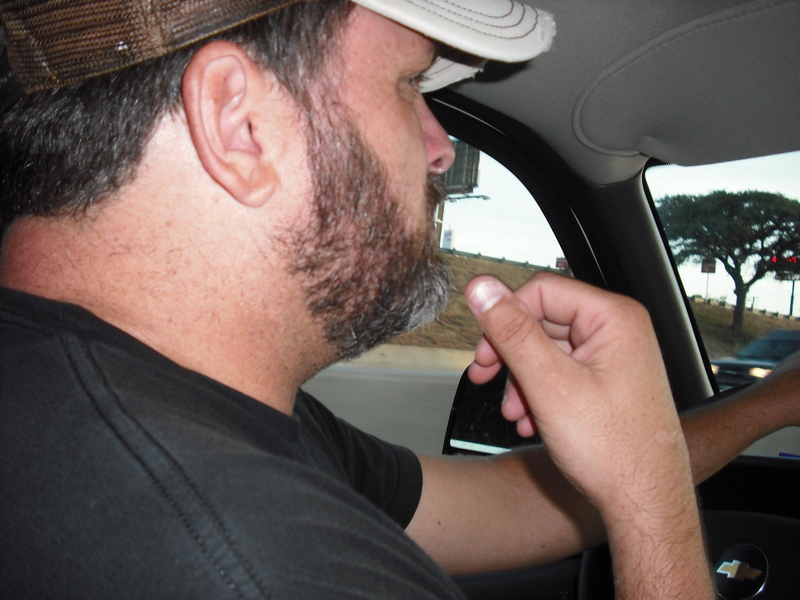 We have a few hours before dinner so a few us decide to take a drive out to completely survey the damaged area. As we drive further it seems never ending. The devastation is enormous, and block after block the scene is the same. It will take time for recovery. It will take resources, people, and prayer. I believe this town will rebuild, and that it will recover in time. The signs of hope are there, and it looks very promising. We head out for dinner, and end up at hot dog and burger joint called Instant Karma. Interestingly enough, the place has a noticeable Austin feel to it from the menu to the decor, and the music playing overhead. We relax, we enjoy the really good food, we laugh, and we learn more about each other. We finish up our meal, and head back to church. Eventually the group heads over to a bar across from the church for some cards, and a few beers. 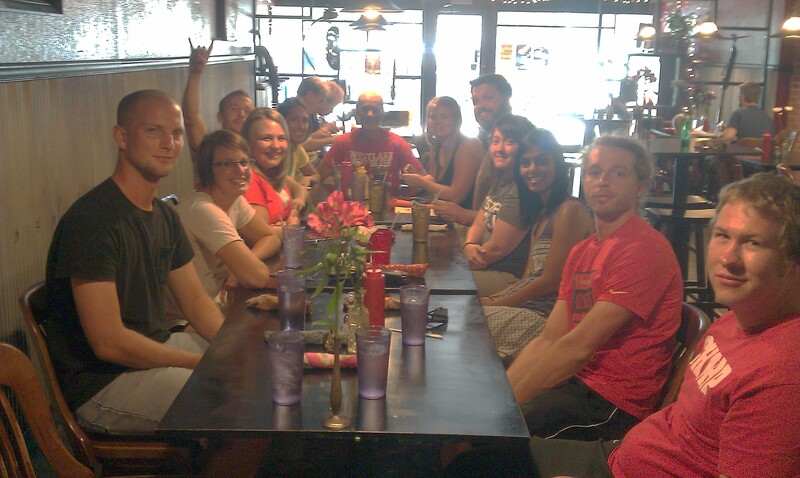 Everyone is winding down, and enjoying our time together. One thing is weird, unlike Austin smoking is allowed in the bar. It’s an odd experience that makes me grateful for our local smoking ban. At 10:00 pm, and we head back to the church before the cover charge at the bar. We sit and listen as Jacob talks about the Acts 29 church planting organization, it’s history, and his pastoral history. It’s good conversation, but sadly I am feeling the day, and it’s time for bed. We have to wake up early to get cleared out for church services in the morning. Tomorrow we will worship with Mystery Church, and the begin the 9 hour drive back to Austin. It has been a good day! 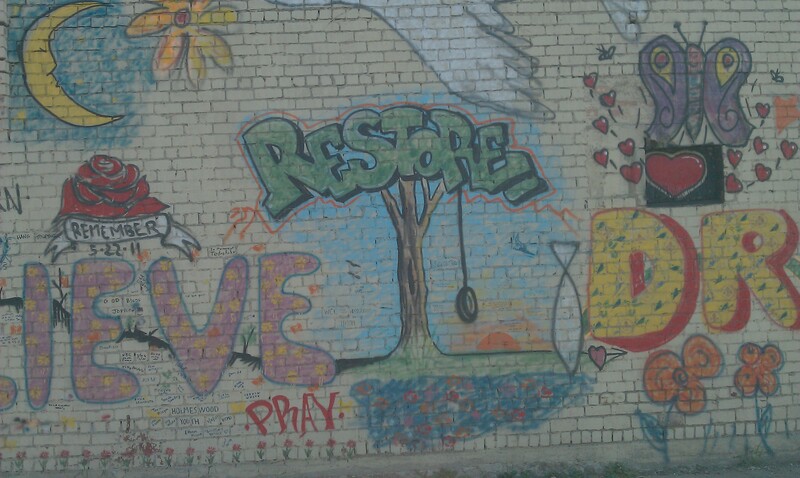 This entry was tagged Joplin, Joplin Relief, Joplin Tornado, North Village Church, Restore Joplin, Soma Austin. Bookmark the permalink.